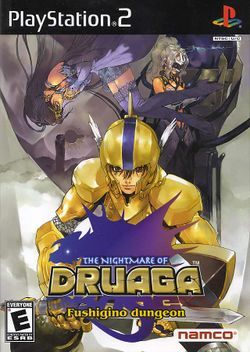 The Nightmare of Druaga: Fushigino Dungeon is a console role-playing game developed by Arika and Chunsoft and published by Namco in 2004 exclusively for the Sony PlayStation 2. It is the fifth game in the Druaga series, following The Blue Crystal Rod, and the eighth game in Chunsoft's Mystery Dungeon series. Set in a fictionalized version of ancient Babylon, the story follows Gilgamesh (shortened to Gil) in his journey to save his fiancée Ki from the evil sorceress Skulld. The story is told primarily through real-time cut scenes. This page was last edited on 27 May 2018, at 03:23.